New remix contest by Blumenkraft, the Swiss Musician, DJ and Producer Marc Roosli. Here is another chance to get released your tracks! The track is ‘Fresh Times’ featuring IreeMC. We are making all the stems available! Remix it in any style you wish and you don’t have to use the full song as long as it’s recognisable in some way. 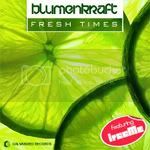 The 2 best remixes will be mastered by Silver Sound in Hamburg and released as part of the official Blumenkraft – Fresh Times Digital release.